peanut butter | Glacier County Honey Co.
No Bake Peanut Butter Honey Bars! For weeks now, Howard’s 3am feeding has left my soggy, sleep deprived mind slogging in circles around one burning set of questions: didn’t a customer email me wanting that peanut butter honey bar recipe we featured during Fill Your Own Bucket Day? Did I accidentally delete the email? What was his name? Did he leave a voice message, instead? Can I un-delete those? Did Maggie delete them? Was this on Twitter instead? What about the blog? Did he comment? Did he like them? Did I dream this up? And so on and so forth. I know y’all know about the 3am to do list. (And for the rest of y’all, I can attest that these are super tasty and about as easy to throw together as it gets). Melt honey and peanut butter in a saucepan, on low. Mix in oats. Press into a 9 x 9 inch pan. Cover and let set overnight. Cut into bars and pack in wax paper. These bars were eaten too quickly for any pictures … but trust us on this, they’re awfully good. If you like honey recipes or you need inspiration on cooking with honey and replacing some of the refined sugar in your diet, be sure to check out our Pinterest Board: Eat Your Honey! You can substitute honey for granulated sugar in many recipes – this is especially easy, and wonderful, in baked goods! Don’t forget to spray your measuring cup with PAM or some similar baking spray in order to easily release the honey from the cup. Reduce the amount of liquid that a recipe calls for by 1/4 cup for each cup of honey, add about 1/2 teaspoon of baking soda, and lower the oven temperature by about 25 degrees to prevent over browning. Honey is particularly wonderful in baked goods, as it seals in moisture with incredible results. If your honey is crystallized, liquefy and get baking! Here’s a recent post on How to Liquefy Crystallized Honey. Previously, we discussed our-new-best-friend-Suzi’s camping essentials: a full size Donna Karan Cashmere Mist deodorant. Very amusing indeed. Today is a much different look at what another dear, dear friend considers camping essentials . We talk about Layla Jane pretty frequently on this blog, which makes sense, as she is one of our oldest friends. To be clear, we are discussing longevity of friendship here – LJ is not long in the tooth, though we do believe that she will be a delightful old lady, one day, probably wearing a floppy hat and little else and sitting on a porch somewhere, telling it like it is in her musical, perfectly cadenced Alabama/Tennessee drawl. Brother Dear once said LJ has the most beautiful accent in the world, and I do not disagree. Sometimes just listening to her speak brings me home. But I digress. Layla Jane is lovely and all, but we are here to discuss her camping essentials. 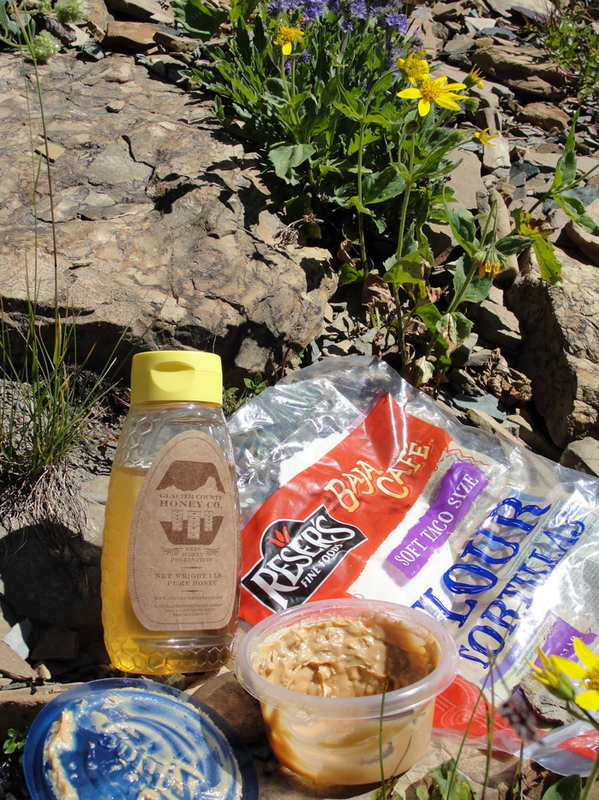 Glacier County Honey, peanut butter, and tortillas. Sugar, protein, and a tasty, easy way to get it down? I think she’s off to a pretty good start. 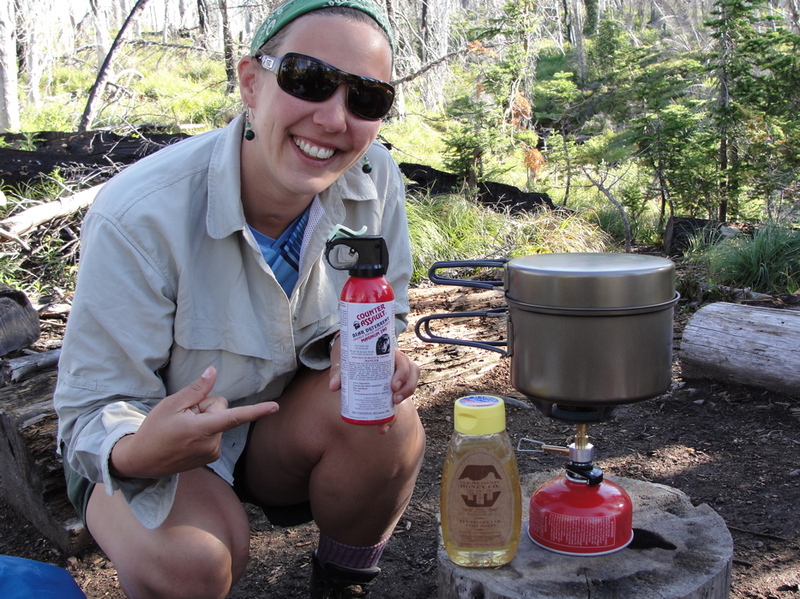 Backpacking stove, Glacier County Honey, and Counter Assault bear spray? Hmmm. I think this girl’s a Hot Bun, y’all. Very professional indeed! What do you think of LJ’s camping essentials? What are yours? 2010. Glacier County Honey Co. Photo credits to Layla Jane. All Rights Reserved. One year ago, give or take a week or two, Honeydew gave me the go ahead to start Glacier County Honey’s retail business – although he is happy to see 100% of our gorgeous white honey go out the door in 55g drums, I am not. Honey this pretty should be placed into fabulous flip top, squeeze containers with wonderful no drip vacuum seals, and shipped to you for your pleasure! And so, not having an inkling of what I was doing, I ordered 1,000 containers and began bottling. I couldn’t justify the cost to print custom labels, so I spent hours in the tack barn, at my desk, and on the kitchen table creating my own labels. 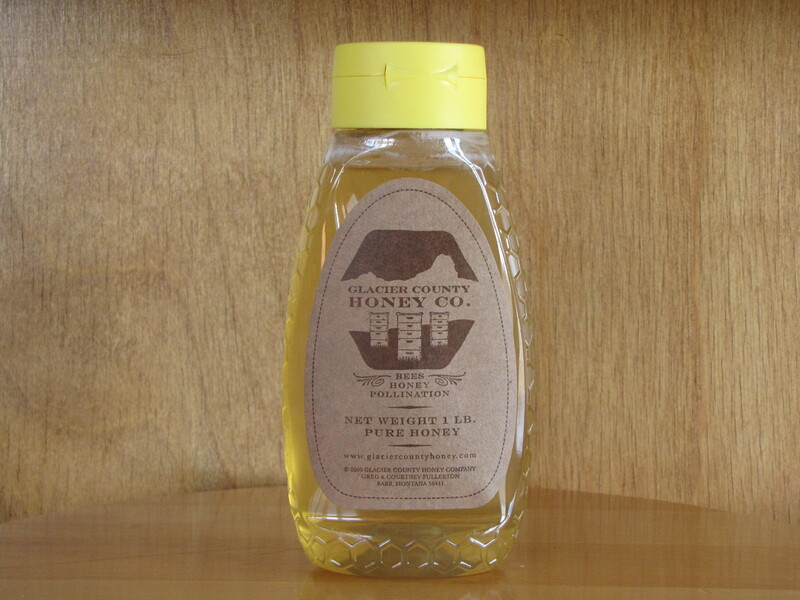 And I loved them, the way the dark brown ink bled softly on the shipping labels, imparting that “love went into this bottle of honey” feel that it is important to me, because it is true of the Glacier County Honey Company. I loved that the rubber beehive stamp caused my fingers to look like they’d been processed in a sepia bath, and I relished rubbing the dye off my fingers as I chatted on the phone, telling my college roommates yes, I started a retail business. In short, I loved everything about the labels, except the cramps they caused in my hands and my neck. And so I replaced them for the more professional, though still homegrown labels we use today. Amazing what can happen in a year. 2010. Glacier County Honey Co. All Rights Reserved. 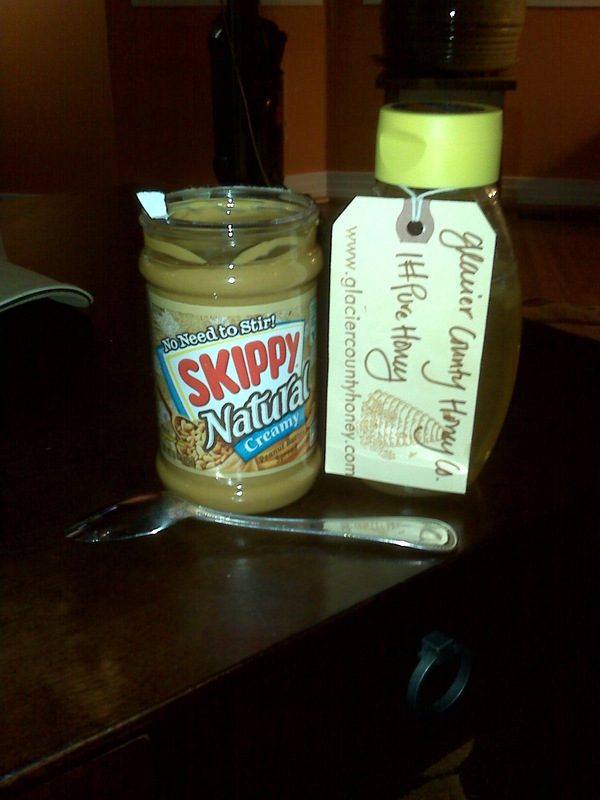 Top photo credit to Lindsey Flaherty, whose boyfriend likes his Glacier County Honey with some peanut butter and a spoon!